We were set to attend the weekly Wednesday church service. My husband was rightly seated behind the wheels, I was rightly positioned to give him both necessary and un-called for verbal support in the passenger seat and the baby rested calmly in his car seat behind. The drive was altogether uneventful until we reached the junction leading to the popular Gimbiya Street on Area Eleven, Garki, Abuja. The road had been blocked by police and FRSC vehicles and we were asked to take another route. That would mean going back to join traffic and do another five minute drive when we were just one minute away from our destination. Thinking the reason for this diversion was the presence of a government official in the area, my husband and I shouted, touted, screamed at the top of our voices and honked to register our displeasure using all the Aluta spirit we were privileged to have ‘received’ from our days in Obafemi Awolowo University. When we refused to move, a kind officer came to explain to us that a house had collapsed in the area and the rescue efforts required they closed the road. At such news, we had no choice but to appropriately apologize for our initial outrage and willingly follow the diversion. As we drove on, I was kind of intrigued that I would have the opportunity to be around a news scene. As a young child, my mum tried to take my siblings and I to wherever it was ‘happening’ in Lagos and I think this flamed my love for being in the middle of events. As soon as the car parked, I announced that I was going to the site of the collapse. Without looking back lest the matter became another round of marital dispute, I headed for the direction where I could see a crowd gathered. I crossed the street, walked past one house, went through a bend, passed another house; at this point I began to realize that I was familiar with the sequence I was covering and by the time I noticed the last step to get to the scene was to cross, I went hysterical. Now, a crowd had formed around me and some were shouting, have you tried her phone? I quickly reached for my phone and called her line. I only got the depressing response ‘the number you have called is not available at the moment, please try again later’. I announced to the crowd, her number is not going through. Another person shouted, wetin be her name? I said Mummy Isaac’. In church, we refer to most mothers as Mummy this, Mummy that just to avoid disrespect. Noticing they showed signs of unfamiliarity, I tried other means to describe her. I said, ‘she has a small child called Isaac’, no positive sign still. Then I remembered that the last time I went with some other people from church to visit her, she had showed us her husband’s dry cleaning business. I quickly looked towards the gate but didn’t see the reception area she had humbly taken us round. I then pointed in the direction of the gate and said amid my grueling fears; her husband runs a dry cleaning business. Hearing this, they all went quiet but I could hear a lone voice saying ‘she dey there, she don die’. I shouted back, God forbid and broke down into tears. The health workers at the site quickly rushed to my side and asked if I came with anyone. 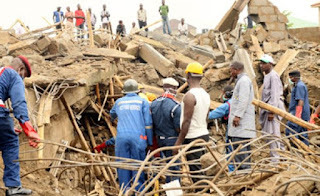 I nodded, dialed my husband’s number and in shaken voice announced, the collapsed building is Mummy Isaac’s house. He rushed to scene, held me and we tried to get further information on what actually transpired. The house, an uncompleted, ill-plastered building with four floors served as shelter to over fifty people who had run to it for refuge from the shackles of unavailable and unaffordable housing in Abuja. In the very early hours of the morning of that fateful day, some of the occupants on the topmost floor heard creaking sounds from the building and quickly ran down the stairs in order to get out of the building. As they reached the door of Mummy Isaac’s apartment on the ground floor, they racked their door with knocks. The knock alerted her husband who stepped out through the backdoor from their bedroom to see what was happening and luckily escaped death. Mummy Isaac also got up, but ran out through the front door so she could wake the people sleeping in the living room including Isaac. However, the building came crashing down on her before she could make it into the open space ahead of her. Isaac was alive until noon but died when he could no longer breathe under the rubble alongside his aunties and uncles who had lain for a good night sleep the night before. Before this incident, collapsed buildings were to me, just another news item. Just another hot topic to keep our mouths busy while we keep our hearts out and refer to issues in the country in the third person he, she or they but hardly in the first person I and we. Now, when I hear unpleasant, tragic news, it is no longer news, it is people. It is adorable Mummy Isaac, charming and utterly pleasant Isaac, his aunties, uncles and my other friends who could be there. Very touching remembrance for the Translated. 2, [url=http://www.klonopincheaponline.com/]clonazepam no prescription [/url] - order klonopin - klonopin without prescription http://www.klonopincheaponline.com/. 2, [url=http://www.kodybank.net/]Generic Valium[/url] - Generic Valium - online pharmacy for valium http://www.kodybank.net/ . 5, [url=http://www.stratterarxcoupon.net/]Order Strattera Online[/url] - Buy Strattera Online - buy generic strattera http://www.stratterarxcoupon.net/ .